We've all been there -- a child gets blood all over their shirt. How do we get that blood stain out? I ran across this great stain removal tip when surfing the net that I just had to share with you. Over at "It Feels Like Chaos" the author shared how her son had an accident and ended up with blood all over his nice shirt and shorts. 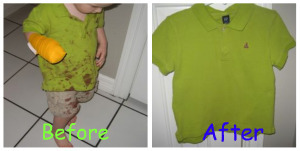 Once she knew her son was OK, the next question became, how to get blood stains out of these clothes? What she did was soak the shirt and shorts overnight in water and Tide With Bleach Alternative. The blood stains came right out. The before and after pictures are at top of this post (courtesy of It Feels Like Chaos). You can also read the full story, at It Feels Like Chaos. My understanding is that this type of detergent is a combination of color safe bleach and detergent. Presoaking clothes is an excellent way to take out many stains. Click here for even more laundry stain removal tips. Immediately remove the blood stains. Use cold water when cleaning fresh blood stains because hot water will just immediately set it. A good alternative to bleach is the combination of white vinegar and baking soda. Mix these two ingredients and add water. Soak your blood-stained clothes overnight in this mixture. The stains will dissolve after one night. It should be easier to clean the next day. My grandmother worked for a laundry mat most of my life. She always said to use a mixture of 2 liters of water plus a squirt of dish soap (laundry soap works well too) and a cup of ammonia and let it sit for about 10 minutes. The blood should come right out. 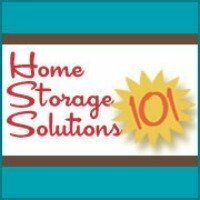 When you are removing a blood stain, or most any type of stain, USE COLD WATER, as hot water will "set the stain" making it more difficult if not impossible to remove. Any type of laundry or dish washing liquid with enzyme cleaning agents or "protein dissolving agents" will work well on blood as the blood itself is protein based. Depending on the stain size and "age" it may take several application cycles, rinsing between with cold water, to totally remove the stain. I personally prefer Dawn Brand dish liquid as it works well, just remember to rinse well before putting in the washing machine and do not dry in dryer until you are satisfied that the stain is gone, or as "good as it gets" because the heat will make the stain permanent!! !